The Forester has always been a favourite with the Barbour jacket set, but Subaru would prefer it to appeal to a much wider audience. 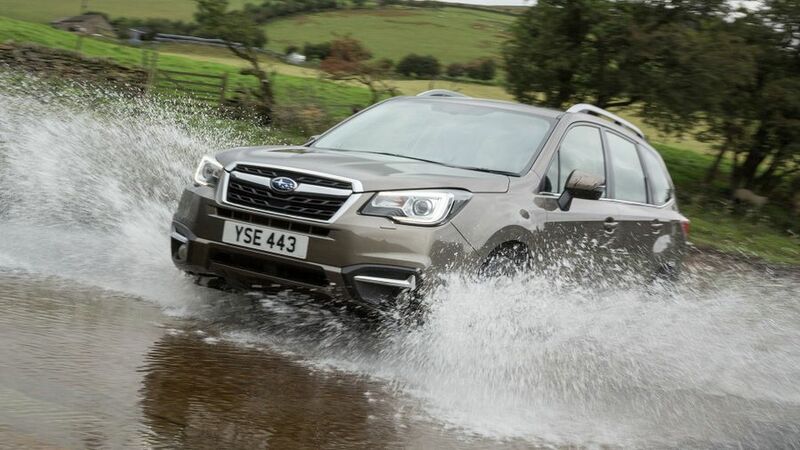 The latest improvements are aimed at making it a more convincing rival to the likes of the Seat Ateca and Honda CR-V.
Subarus in general are renowned for their hardy nature, and the Forester in particular has a hard-won reputation as a tough, go-anywhere vehicle. 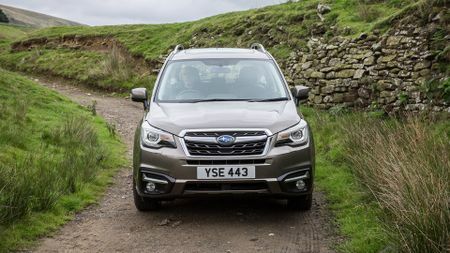 Really, though, in a world of SUVs that deliver all the comforts, connectivity, refinement and easy driveability expected of a modern family car, the Forester is always going to struggle to appeal to urbane city types. Although the latest model is more comfortable and more refined, and the cabin looks plusher and more up-to-date, the interior still has the whiff of something slightly agricultural. Crucially, the poor high-rev refinement of the flat-four diesel engine, allied to incredibly vague steering and an all-too obvious lack of front-end traction, mean the Forester is seriously outclassed by too many rivals. The role of the 4x4 has changed massively in recent times. More often seen in the hands of yummy mummies than backwoodsmen these days, modern SUVs are infinitely more refined, substantially more comfortable, and immeasurably easier to drive than their heavy-metal forebears. 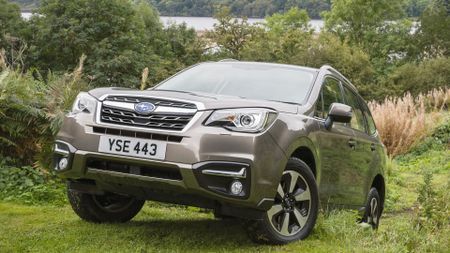 Although the Subaru Forester remains synonymous with green wellies and Countryfile, the latest facelift and revisions to refinement and comfort are aimed squarely at a more discerning audience, whose voracious thirst for ever more sophisticated SUVs shows no sign of abating. While the latest exterior refresh is limited to a revised grille, an updated bumper, and LED lights, the updates to the cabin are intended to make things look and feel more modern and provide higher quality. The interior is now finished with softer-touch materials and adorned with some fancy piano black highlights and additional sparkly metallic trim, while all the major instruments, including the sat-nav display, have a higher-resolution. Subaru has also tried to make the Forester more refined, fitting thicker glass in the door windows and adding more soundproofing material into the dashboard to limit the amount of wind and road noise entering the car. The suspension and steering have also been tweaked in an attempt to improve the car’s ride and handling. The engine range remains unaltered, however, with 2.0-litre petrol and diesel flat-four units (with 148- and 145bhp, respectively) as the bedrock powertrains – the diesel being the main staple. These are supplemented by a rip-snorting turbocharged petrol engine, which produces 238bhp at full chat. This engine is linked to an all-new CVT automatic transmission, and like all Subarus, it comes with all-wheel-drive as standard. Figuring that the high running costs associated with the petrol turbo-nutter will see it remain a pretty rare sight in the UK, we plumped for a test drive in the best-selling 2.0-litre diesel. Although the Forester’s rather conservative styling looks pretty dated compared to the plethora of funky SUVs that have hit the catwalks recently, in many ways, it’s all the better for it. For instance, the boxy, upright design and vast expanses of glass – both to the sides and to the rear – encourage masses of daylight to flood into the cabin, and this glasshouse effect also provides superb all-round visibility. Despite its fairly substantial dimensions, the Forester’s blunt tailgate and commanding view over the bonnet make it feel surprisingly compact when you're driving, which comes in very handy as you thread your way through congested urban streets. 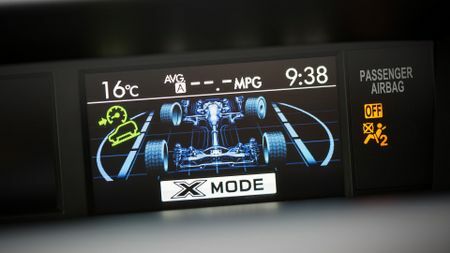 Equally, nipping into that last cherished parking space outside the school gates is also a relative doddle compared to design-focused products such as the Peugeot 3008 and Toyota C-HR, which rely heavily on cameras and acoustic parking sensors to help avoid bumper scuffs. Subaru reckons it has reworked the Forester’s suspension to improve comfort, and retuned the steering to quicken up reactions, but only one of these two upgrades has been successful. 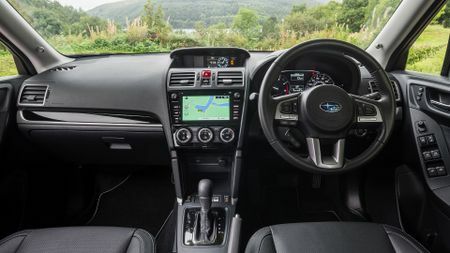 While the ride is certainly comfortable, ensuring battered road surfaces and even grizzled railway crossings are dismissed with ease, any improvements that Subaru’s stoic steering engineers have managed to dial in are steadfastly undermined by a fundamental lack of front-wheel grip. You’ll have to go an awfully long way to find another four-wheel-drive car with less steering feel or one that will break front wheel traction so readily. As a consequence, a gingerly applied throttle is definitely the order of rainy days, if you want to keep everything heading in the right direction when circumnavigating a slippery roundabout. Find a straight stretch of road, however, and the diesel Forester’s relatively light weight and strong mid-range power delivery produce some surprisingly vivid performance. Refinement is not a particular strong point, however. The uniquely configured 2.0-litre flat-four diesel engine is a bit vocal on start-up and at idle, but you forgive that. It’s even quite hushed when dossing along in top gear, but drop a cog or two to summon up a burst of overtaking acceleration, and it pings and reverberates like a squadron of woodpeckers knocking out a dawn chorus on an old biscuit tin. You’ll also notice a few additional whizzes and whistles that you could do without, including a fair amount of turbo induction whoosh and some indiscreet levels of gearbox lash, as the various shafts and cogs whirr themselves dizzy. If you listen closely enough, you’ll even hear a defined solenoid click coming from under the dashboard whenever the rear wiper is called into action – and that’s something we haven’t heard since the days of Datsun Cherrys. The Forester’s brakes are a bit of a curate’s egg, too. Ultimately, they supply sufficient stopping power, and plenty of engineering thought has gone into ensuring the pedal return is heavily damped, so that it doesn’t ‘thwack’ back when you step off the brakes. That said, the feel you tap into when applying the pedal is rather wooden, so it’s not so simple to judge just how much force to apply when scrubbing off speed. Despite feeling like quite a compact vehicle from the driver’s seat, there’s actually a surprising amount of room in the cabin, especially in the rear. 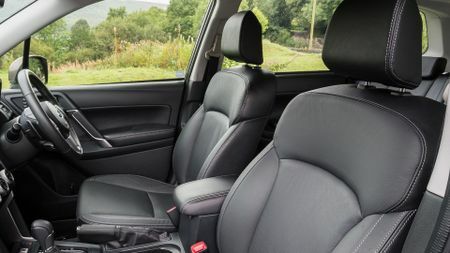 Also, despite the Forester’s relatively high ride height, because all four side doors open wide and the roof line is pretty much horizontal, getting your ageing Aunt Able into her seat or loading your squirming little ’uns into their child seats should be a relatively stress-free affair. Because of all the 4x4 gubbins underneath, the Forester’s boot load floor is rather high, and at first sight, the boot itself appears to be quite shallow. That said, at 505 litres, or 1,595 litres if you drop the rear seats via a handy release button inside the boot, it should be more than capable of coping with most family’s needs. This very much depends on your lifestyle. If you live in remote parts or spend your weekends green-laning, then the Forester is undoubtedly still an alluring proposition, as its strong off-roading abilities, hardy mechanicals and brilliant all-round visibility will no doubt get you out of no end of sticky situations. 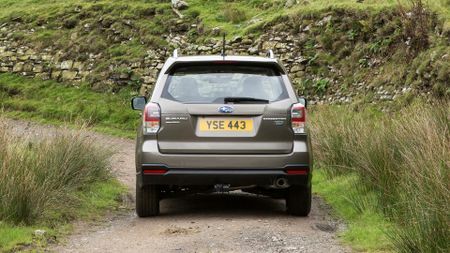 Conversely, for those of you who live a more sedate existence, the Forester’s rather agricultural powertrain, dated-looking interior and unengaging driving manners will make it seem seriously old-school compared to countless more sophisticated rivals, including the likes of the Seat Ateca, Honda CR-V and Kia Sportage. The Ateca is a sweet-driving family SUV that's available in front- or four-wheel drive. It looks the part, is great value for money and is underpinned by proven Volkswagen mechanicals. The Honda CR-V is one of the best five-seat 4x4s. Its cabin is spacious and practical, and the 1.6-litre diesel engine combines respectable performance with low fuel bills. The Sportage is a hugely popular family SUV, and for good reason. It’s decent to drive, practical, generously equipped and high in quality. An impressive family car. Interested in buying a Subaru Forester?